It was the extended weekend of Friday-Sunday(10-12 Aug.) due to Janmashtami , I had therefore already booked room at MTDC, Malshej Ghat in advance for Friday overnight stay , as it is impossible to get booking for Saturdays , blame it on Gujjus who are always ahead in planning their vacations , also manage to bring big families together without conflict , I like this quality & family togetherness & always adore them for their travel enthu. I am having tendency to analyze people , there geographical location , roots & behavior , this time also I have observed that whole place was occupied by them only , as usual . KM in parenthesis is distance from Thane Maziwada Jn. We loaded essentials like Latest songs , water ,some munching stuff & lots of enthu .We started at 9:30 AM from Thane ,through Bhiwandi – Kalyan â€“Nashik NH3- route , we took right turn exit from highway at Kalyan(20 KM) to Murbad route . 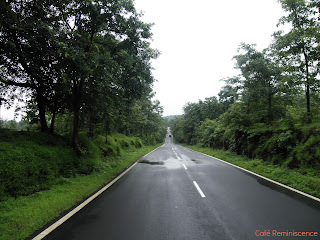 Crossing Kalyan was a bad experience , bad road , full of pot holes , even down side road was closed , as it was in extremely bad condition , even munciple authorities have lost hope to revive it , oh yes I also paid 25 bucks toll for this Kalyan road , phew… At (25 KM)we saw 1st sign board Malshej Ghat , NH222 .We took right side flyover road forming â€œ Yâ€� shape bifurcation . Next was Ulhasnagar at approx (26 KM) , my daughter who was tracking route told me that now we will drive thru highway ( mean NH222) , she was expecting Mumbai-Pune expressway sort of highway , I told her , single pot holes road what we are driving thru right now in fact is national highway NH222 , she somehow did not like this new info , anyways after crossing river (picx)at (34 KM) road quality suddenly improved , almost no pot holes , with green surroundings , road side sign board reads Malshej Ghat 67 KM. Road after Murbad ( 55 KM) was much better , smoothened , weather was cloudy but almost no rain so far. Only after crossing Murbad real pleasure trip starts Lush mint green surroundings , beautiful , smooth dark black Asphalt road , as if painted just now (pica), Car outside Temp. reading was 26 Degrees wow !We reached Salgaon village ( 66.7 KM) , road side board reads Malshej Ghat 46 KM . 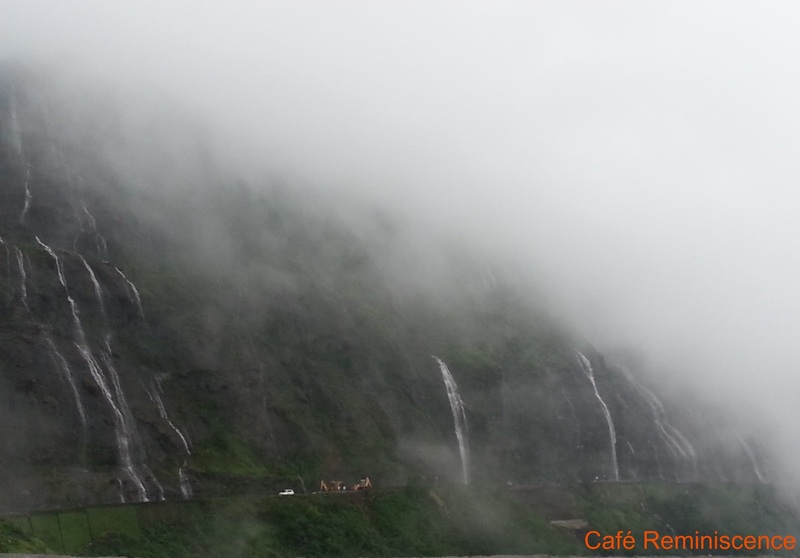 Mountain range with cliffs covered with clouds now visible , adding excitement & fuelling our expectations for what lies ahead .We had our tea at Pranjali restaurant (73.6 KM) as I was delighted to see a restaurant facing small river ( rain water nallah), flow was in full swing , making it a perfect place to have Chai , fantastic. We then reached village Tokawadi ( 81 KM) What a beautiful scenic view truly majestic , misty hill tops , few waterfalls also visible , trees lined up on both side of roads , I also snapped few huge wisdom trees pics , I am always fond of huge trees specially Wisdom ( Bargad)& remember most of the places in Mumbai , where we have huge tress like south Mumbai , Matunga , Khar , Bnadra etc. We started ascending hill at (86 KM), with every passing KM scenic beauty also getting better & better , Mile Stone at 91.8 KM reading NH222 Malshej (pic) .After few KM ( 103 KM) there was a water falls on right side , we got down & took some snaps .Now we can feel clouds .,fog at road level like we are passing thru deep fog & many water falls were there . 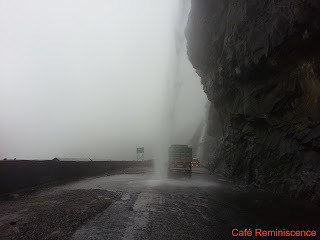 Although I was expecting that there will be dense fog & few water falls , but did not expect that a water fall (pic) with tons of water just at the center of road from cave like mountain hammering your vehicle ( Nano may not take that load ) , this water fall ( 112 KM) was just amazing . 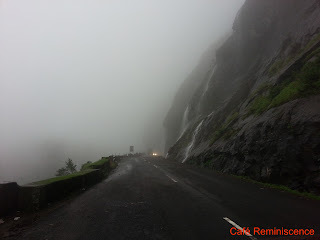 It was heavy fog with visibility of only 10 mtrs , temperature was a bit chilly ,we drove thru few more minor waterfalls , so far after Murbad road condition was extremely good , but due to waterfalls & landslide road condition was slightly bad & also at one place half of the road was closed due to landslide , although heavy machines were already deployed to clear the landslide . After crossing water fall we had bhuttas as some parking space was available , overall environment & panoramic scene was beyond imagination , it was raining , clouds , fog , also seen clouds ascending picxx , the whole view was panoramic , ahhhha ,feel like just sit there forever & watch nature . Finally we reached MTDC resort ( 115 KM ) visibility was hardly 10-12 mtrs , only gate was visible , also inside MTDC (pic) resort it was water everywhere , clouds at your room level , parked cars also not fully visible. Awesomeâ€¦. After check in we had our lunch , it was OK , Flamingo dining hall was nearly full , everybody seems to enjoying wetness as whole resort including corridors were wet & literally Pani everywhere . After having our lunch ,me & Sid wanted to walk up to nearby waterfall , we went out but come back again as outside MTDC resort main entrance, on main road ( NH222),visibility was so poor that it was impossible to walk on road side , as passing by vehicles only head lights were visible & driver may not be able to see you , it was rather unsafe ,therefore we came back. 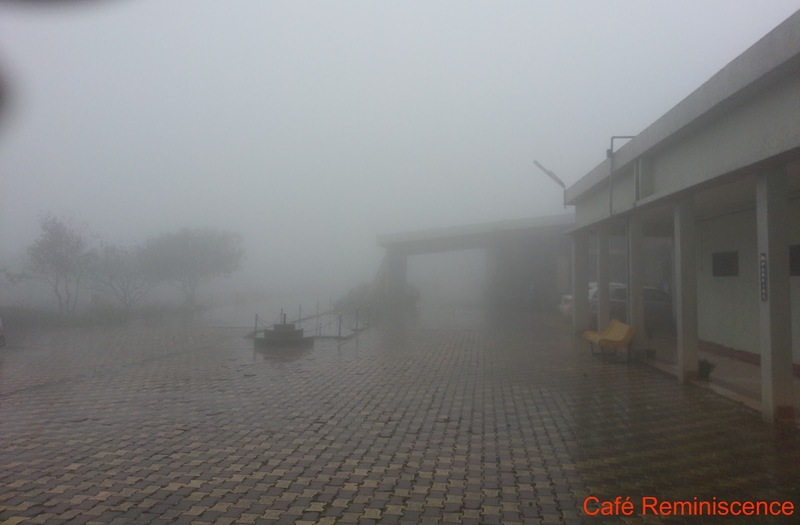 It was better to drive then walk , we then took our car and we all went for a drive back to waterfalls to enjoy surroundings , also further down side after MTDC there is a Dam & Lake , also not much fog , area was lush green , there is a resort named Sushant . 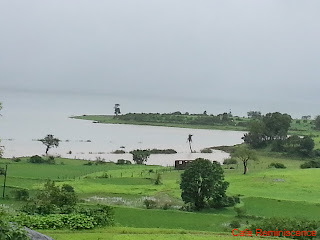 We had our evening Chai at road side Thela , having dam/lake(pic) in the background . Dinner at MTDC was OK . I went out for a walk after dinner , the place reminds me of starting scene of the BR Chopra movie â€œ Dhundâ€� watched long back starring my fav,Danny & Zeenat , that place also seems to look like Malshej only ,Dhund everywhere & only vehicles head lights are visible. I must say that Danny has played the role of a handicapped jealous husband of a beautiful young wife ( Zeenat , who else ) with ease & perfection. It was raining intermittently almost whole night , I was wondering there is almost no continuous rain this season in Mumbai , no water logging , no disruption & this place , oh ! water & water everywhere !! Next day we checked out at 9 :00 AM it was raining heavily & very cold , we did not find anybody at any waterfall, maybe it was too early also water may be very cold , I wanted to take few snaps of the valley , but unable to take as it was raining , also fog was too dense & almost no visibility to take snaps , but it was heavenly experience to walk or drive thru such a lovely place . It took almost 2 Â½ hrs to reach Thane ( 115 KM) . Whole trip was such a wonderful experience & we overjoyed it.